First article in series on building games, that are easy to maintain. Many tutorials show you, how to build game. Let’s say, you already have one. And because it is good and catchy, sponsors are interested in it. Your nice and clean code is step by step polluted with sponsor specific APIs. Maybe, even worse, you are maintaining separate project for each sponsor and fixing bug in one file needs some synchronization into other projects. Or game is built on your libraries and you add some feature, you would like to propagate into all your games. Or you need easy way how to parameterize game globally or individually for specific sponsor. In this series I would like to address these issues and build game, that is easy to maintain. With one change of parameter, you can build for another sponsor or you can easily parametrize it without rebuilding, etc. This is our configuration file, that will say to Typescript compiler, what files to take, what file not to take and what to do with it. In Include array we are specifying, we want to tak all source files from folders lib and src. We want to merge all into one output “maintainable_game.js” in js folder. In lib array, we are specifying libraries we want to use. As we will use asynchronous functions in later chapters, we want to include promises. 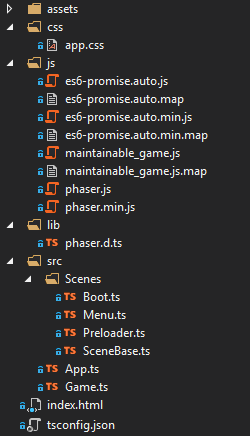 Take Phaser Typescript definitions (phaser.d.ts) and put it here. Be patient, Phaser is still under rapid development, so there is really a lot of bugs in it. Fortunately, it is usually easy to fix. Files in this folder are more complex, so it is described separately in next section. There is nothing special – we simply create Game class that extends Phaser.Game. In constructor we pass parameters to super class (Phaser.Game) and we specify type of renderer, parent div element on page (see index.html), size of game canvas and name of our game. Then we add three scenes and launch Boot scene. For our convenience there are two getters: gameWidth and gameHeight. In Phaser 3 it is much more difficult to get these than in Phaser 2, where you simply wrote game.width or game.height. setView method is another handy method for me. It sets camera to center on coordinates 0, 0. Setting you camera in right way can simplify your game code a lot. For tetris like games I usually set camera so 0, 0 is in bottom middle. Centering on 0, 0 and placing gameobjects around it can save you a lot of work when you start to solve various screen sizes and resizing. We will now use SceneBase class as base scene for our three Scenes. Add them one by one. Of course, it may be “polluted” with other files and folders generated by IDE of your choice. We have basic project set. In next part we will load general game config, which will allow us to parametrize game without need of rebuild. Files for whole series are also put on GitHub (as I am using Visual Studio Community 2017, there may be some additional files specific to IDE).